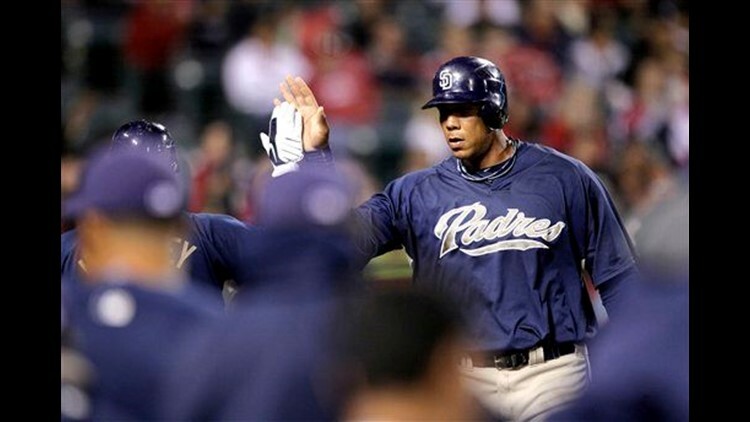 ANAHEIM, Calif. (AP) — Kyle Blanks went 2 for 2 with a three-run homer to lead the San Diego Padres to a 5-3 victory over the Los Angeles Angels on Thursday night. Blanks scored on a fielder's choice in the fourth inning to break a 1-1 tie. In his next at-bat, Blanks homered to center field off of reliever Michael Kohn to give the Padres a 5-1 lead. San Diego starter Chris Young pitched into the fourth inning, allowing one run on four hits with six strikeouts and three walks. The Angels took an early lead in the first inning when Hideki Matsui singled off the glove of Padres first baseman Adrian Gonzalez to drive in Bobby Abreu. Angels starting pitcher Joe Saunders pitched five innings and allowed two runs on four hits with four strikeouts. Saunders hit Blanks with a pitch in the second inning and Blanks came around to tie the score at 1 on an RBI double by Scott Hairston.